Everyone wants things. Better job, more money, more satisfying relationships, better health and more energy. Our space is virtually littered with the “wish bubbles” of energy we put out. When you want something and you focus your thoughts on it, you create a bubble of energy that is charged with your desire. I call it a mock-up. If your mock-up is clear and your space is clear, the powers that be begin to engineer the situation(s) that will bring your desire into your life. Of course those manifestations will be the result of all the energy you put out – the fear, the confidence, the programmed ruts, the out-of-balance chakra’s, the joy, the anger – all of it. If you’re asking for money and you have a program that says you have to work hard for your money – look out, you’re about to manifest the situations that will allow you to work hard for your money. Getting your space clear, harnessing your negative thoughts and clearing your chakras all make your mock-ups easier to complete. Remember the universe acts on orders, so being clear about what you want and maybe even how you want it can help you receive exactly what you’re asking for. I took meditation and energy healing classes with someone who was so crystal clear that when she asked for a green leather couch no one was surprised when an old friend from high school called her to say goodbye as he was moving and asked if she wanted any of the furniture he was getting rid of, say, a green leather couch? The second story comes from a book I read a long time ago – the author and the title have disappeared from my memory – but the story stuck. A young boy wanted a car like the one his uncle had. He focused his thoughts on his uncle’s car. He asked for that car. He was clear in exactly what he wanted. Long story short, his uncle died and left him the car. He got what he wanted, but not the way he wanted it. I want to be clear – I’m not suggesting that the boy’s desire for his uncle’s car was what killed his uncle. Who knows what killed his uncle? But the energetic pathway was cleared because his uncle died and the boy got his desire. Would anything have been different if the boy had focused on a car like his uncle’s car but that wasn’t his uncle’s car? I’m thinking that it couldn’t have hurt. So, if you’re new to the practice of moving and healing energy, or just beginning to notice yourself as an energetic being, you might try clearing your space and practicing by putting out a very small mock-up. A clean, clear energetic bubble that holds your wish. Ask for something easy to achieve and something you wouldn’t necessarily have gotten without asking for it so you can see how your mock-up powers are working. Perhaps you could ask for someone unexpected to take you out to dinner. Watch, you’re having coffee with a friend and they suddenly offer to take you to dinner. Or you get a coupon for a free dinner when you get the mail a few days after you asked. Test your ability. You’ll be amazed. The clearer you are and the clearer the mock-up, the more likely you’ll get it. But remember to ask for it in the positive and you might want to tag on a line like: and no one gets hurt in the process. Pick something easy but clear so when you get it you’ll know you manifested it. You’re manifesting all the time, so why not start working up to manifesting that leather couch? Myself, I’m going for brown. Deb McLeod is an energy healer at Whole Health Centers. 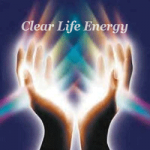 Her company, Clear Life Energy, provides healing and training in managing life’s energy.